Susanne Winnacker: Countdown ARC giveaway! Today marks the 4-month countdown to the publication of IMPOSTOR! I can't believe we have less than half a year left! 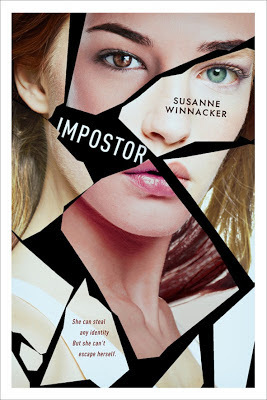 To celebrate this special day, I'm giving away a signed ARC of IMPOSTOR! CAN TESSA POSE AS MADISON . . . AND STOP A KILLER BEFORE IT’S TOO LATE? Tessa is a Variant, able to absorb the DNA of anyone she touches and mimic their appearance. Shunned by her family, she’s spent the last two years training with the Forces with Extraordinary Abilities, a secret branch of the FBI. When a serial killer rocks a small town in Oregon, Tessa is given a mission: she must impersonate Madison, a local teen, to find the killer before he strikes again. Tessa hates everything about being an impostor—the stress, the danger, the deceit—but loves playing the role of a normal girl. As Madison, she finds friends, romance, and the kind of loving family she’d do anything to keep. Amid action, suspense, and a ticking clock, this super-human comes to a very human conclusion: even a girl who can look like anyone struggles the most with being herself. There are several pieces of good news I'm sitting on right now (blurb-y things among them), but hopefully I'll be allowed to share them soon! This giveaway is international and open until January 31st! I'll announce the winner February 1st. All you have to do to enter is leave a comment for this post. I am so so excited for your new book, Susanne! The Other Life is awesome and I have a feeling Impostor will be too! One of the most anticipated YA book of the year! I'm so excited for your new book! The cover is stunning! Wow! An intriguing premise for a story, similar to some other novels, but unique in its own right. I'm keen! Thanks for the international flavour. I really loved The Other Life, and hope to read this one too! Thanks for this AWE-SOME giveaway!! I also Facebooked about it. The book sounds great! And I love the cover, so clever. :) Thanks for the opportunity! Thanks for giveaway, I would love to have ARC so I can review it on my blog. Thank you for the international giveaway!! I would love to read your book :D.
This book sounds fascinating. Can't wait until May. Thanks SO much for the giveaway! I am so excited to read Impostor! It sounds way awesome!! this looks fab. I'd love to read it.